Coughs can have many causes, and herbs have long been used by people who have coughs . Intracellular Cough™ has been formulated to provide nutritional support for those who have a pattern consistent with an intracellular bacterial infection—and who normally demonstrate this with a chronic cough which is not known to have another cause. While allergies can cause many to have chronic coughs, Intracellular Cough™ is not intended to be used for coughs due to allergies. However, human research has shown that those with allergies can develop a bacterial sinusitis that contains intracellular bacteria in the sinuses —for those people Intracellular Cough™ may possibly be indicated. Mainstream research involving horses and dogs confirm that some chronic coughs seem to be related to intracellular bacterial infections [3-4]. Human research has also confirmed the presence of certain chronic coughs with intracellular bacteria [2,5-8]. Some strains can include Rhodococcus equi , Bordetella pertussis  (though it tends to more acute than chronic ), and Bordetella bronchiseptica , and Anaplasma phagocytophilum  . “The bacteria causing diphtheria, whooping cough, cholera and other diseases secrete mono-ADP-ribosylating toxins that modify intracellular proteins ” . Some intracellular infectious agents, such as Simkania negevensis do not seem to directly cause chronic coughs , even though they have been suspected as causative agents. Because of the nature of some of these infections, normal immune support products often do not provide the type of relief that the sufferer is hoping for. Many of these infections agents are difficult to deal with [6-7], which is part of why various standard interventions are inadequate. For some in that category, Intracellular Cough™ may be indicated. Sometime in the last decade of 20 th century, some natural health professionals began specifically advising the combination of substances such as bovine glandulars, bromelain, vitamin C, B vitamins, and lecithin as nutritional support for the immune system support when intracellular bacterial infections were encountered . And now for the first time, this type of relatively new strategy is now available in a 100% Food product for in the 21 st century. Acerola Cherry Malpighia glabra is a Food source of vitamin C  and natural bioflavonoids. Bovine aorta, heart, hypothalamus, liver, lymph, parathyroid, pineal, pituitary, spleen, thymus, thyroid, and tracheal tissue are all considered to be cytotrophins. Cytotrophins are cell-food, and these glands have been carefully dried at low temperatures to retain enzymes and other constituents to help the cells. Aorta and heart are intended to support the heart and related circulation . The hypothalamus and pituitary are master endocrine glands and promote proper health throughout the body, while the pineal gland regulates circadian rhythm . The liver contains Kupffer cells, which are large macrophages that can efficiently cleanse the blood of various bacteria . Lymph tissue is used to support lymphatic tissue . “The lymphocytes are located most extensively in the lymph nodes, but they are also found in specialized lymphoid tissues, such as the spleen…When the blood is invaded by infectious agents, the reticuloendothial cells of the spleen rapidly remove debris, bacteria, parasites, and so forth. Also, in many infectious processes, the spleen enlarges in the same manner that lymph glands enlarge and then performs its cleansing function even more adequately” . The parathyroid helps increase serum calcium levels --increases in intracellular calcium seem to help the body fight various infections . The thyroid promotes proper metabolism . Bovine Thymus supplies thymus tissue. “The T lymphocytes, after their origination in the bone marrow, first migrate to the thymus gland. Here they divide rapidly and at the same time develop extreme diversity for reacting against specific antigens. That is, one of the thymic lymphocytes develops specific reactivity against one antigen...These different types of processed T lymphocytes now leave the thymus and spread throughout the body to lodge in lymphocyte tissue everywhere…The thymus selects which T lymphocytes will be released” . Oral consumption of a bovine thymus extract has been shown to reduce the frequency of recurrent respiratory infections and increase salivary IgA in children . The thymus gland contains thymic hormones which Schulof found may enhance immune response for people with HIV . Oral supplementation with bovine thymus has been shown to be capable of enhancing T-lymphocyte activity, probably due to a thymosin-like activity . Bovine Tracheal Cartilage contains chondroitin-sulfate-A which some have suggested is helpful for various types of bacterial infections. After activation, natural killer cells release peptides including “chondroitin sulfate…and destroy malignantly transformed cells by necrotic process” . Bromelain and Elderberry and have been reported to be beneficial for respiratory infections . 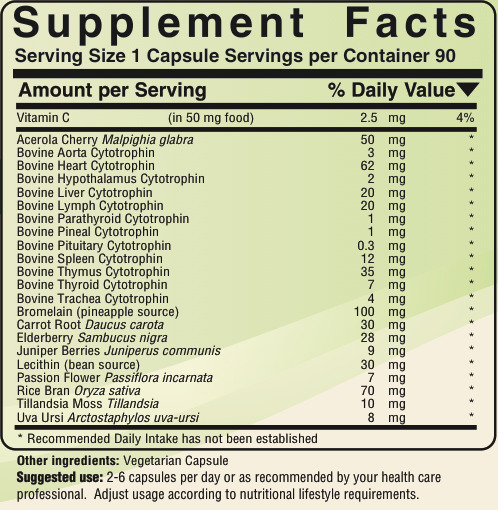 Carrot Root naturally contains betacarotene, a vitamin A precursor. Vitamin A is used by the body to strengthen the immune system and to help fight infections . Elderberry Sambucus nigra is approved by the European Commission E for coughs, bronchitis, fevers, and colds . Elderberry also can protect various tissues from injury from oxidative stress . Juniper Berries Juniperus communis are used to treat “herpes and flu infections” and severe inflammation due to bronchitis. Juniper has long been used for people with coughs . Lecithin is a source of phosphatidylcholine , and herbs that seem to trigger phosphatidylcholine secretion have traditionally and successfully been found to antitussive activities against the coughs associated with bronchitis . Passion Flower Passiflora incarnata “stimulates respiration” and has claimed sedative properties  . Rice Bran Oryza sativa is an excellent Food source of many B vitamins . In Indian medicine, “[r]ice is used for pneumonia” . Tillandsia Moss Tillandsia usneoides absorbs toxins and pollutants . Uva Ursi Arctostaphylos uva-ursi seems to have some bactericidal properties . Note: Do not delay necessary medical treatment because of this or any other supplement. Some people with intracellular coughs report that they have needed to take nutritional supplementation for two to three months before noticing substantial improvement. However, if one does not notice benefit when taking Intracellular Cough™ within three to four months, then it logical to conclude that it probably is not useful to continue. Jurisic V. [Characteristics of natural killer cell]. Srp Arh Celok Lek. 2006;134(1-2):71-6.